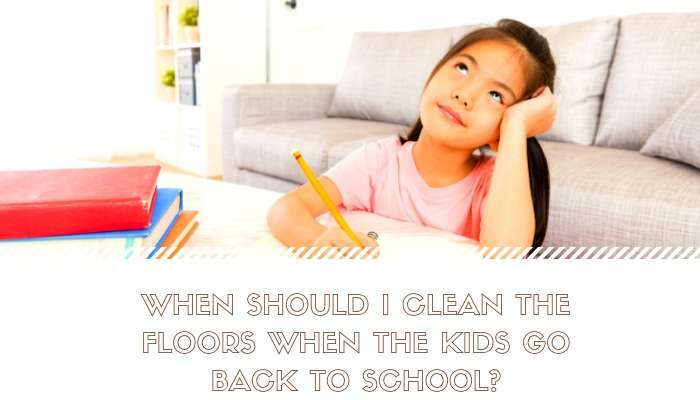 When Should I Clean the Floors When the Kids Go Back to School? School bells are ringing all over Western Washington, and many parents are rejoicing at the reprieve from cleaning up after constant activity and traffic through the home. Now that the house is a little quieter there is no better time to fit in your annual carpet, tile, hard surface floor, and upholstery cleanings! There is no better setting for professional carpet cleaners to come in and work their magic than on an empty home with plenty of time for the carpets to dry. Have the cleaners come in right after the kids leave for school and by the time they arrive home your carpets should be dry or nearly dry and ready for the whole family to enjoy the comforts of a freshly cleaned home. With hot water extraction carpet cleaning much less liquid is used and the drying time is faster, so it will be like your family arrived home after the cleaning fairies came. Move any furniture and items on the floors that you will want cleaned under and around. Get the most out of a carpet or other professional floor cleaning by removing everything from the floors if possible. Vacuum the floors thoroughly after every item has been removed from the room. Make sure to go slowly to get up as much loose dirt as possible so that the cleaners can spend their time focusing on the deep down gunk a vacuum can’t reach. Be prepared to not walk across the floors while they are still wet. Your carpet should only be wet for about a day or less depending upon the size of the room/floor cleaned and air flow to the room. If you can’t avoid contact with the wet carpet make sure you walk across slowly and carefully with clean bare feet only trying to limit the use of the wet floor as much as possible. With the holidays right around the corner and everyone out of the home during the day, you will be glad you scheduled your professional floor cleaning during the back to school season. It will also give you a burst of energy and feeling of accomplishment that will help launch everyone into a successful and fresh start for the new school year. You will also be proud to host guests in your freshly cleaned home during the coming holidays. For the best in professional upholstery, tile, carpet, and hard surface floor cleaning in Marysville and surrounding areas make an appointment with All Kleen.